U.S. soccer goalie Hope Solo has come forward to say she would boycott the Olympics if they began now thanks to the Zika outbreak in Brazil—and she's not pregnant. 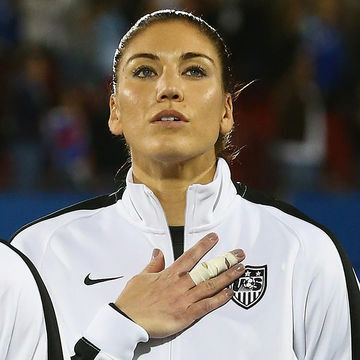 She's one of the best-known athletes in the world, but World Cup U.S. goalie Hope Solo claims she would boycott the Olympics if they were held today for one very simple reason: She doesn't want to expose her unborn children to the Zika virus. The CDC has been very clear about the fact that pregnant women are not advised to travel to areas affected by the virus—their list of no-go travel sites includes Brazil, which is where The Games will be held come August 5. Solo has said she wouldn't put her family at risk...but she's not pregnant, at least as far as we know. Solo says she wants to start a family someday and while she doesn't know when she'll conceive, she does think traveling to Brazil would not be worth the risk. "If I had to make the choice today, I wouldn't go," the 34-year-old soccer star told Sports Illustrated. "I would never take the risk of having an unhealthy child." While you can never be too cautious, travel advisories are only in place for anyone who is pregnant or trying to conceive, at least for right now. Doctors say there's no reason to believe contracting the virus could affect future pregnancies. "I don't know when that day will come for Jerramy and me, but I personally reserve my right to have a healthy baby," Solo, who is married to former Seattle Seahawks player Jerramy Stevens, said. "No athlete competing in Rio should be faced with this dilemma." But the United States Olympic Committee sees things a bit differently: they are not recommending athletes boycott The Games. "We are closely monitoring the situation," said USOC spokesman Patrick Sandusky. The Zika virus has been linked to microcephaly, a disorder that can cause babies to be born with abnormally small heads if it affects a pregnant woman. Do you think Solo's stance makes sense, even though Zika is said to only be dangerous for pregnant women?